This time two weeks ago, we were sat on my couch together reading Menstrupedia in preparation for our interview with Aditi Gupta after which you and I went out shopping for ingredients at the giant Tesco. And then, you and Shane made Palak Paneer while I sat down for an hour and a half getting some remaining work done. 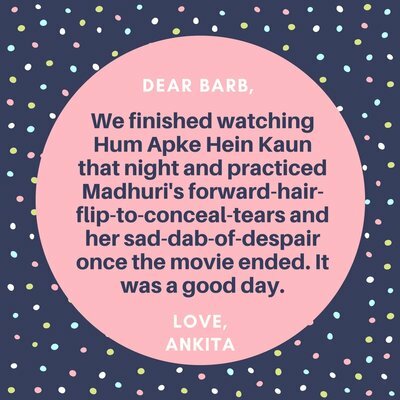 We also finished watching Hum Apke Hein Kaun that night and practiced Madhuri's forward-hair-flip-to-conceal-tears and her sad-dab-of-despair once the movie ended. It was a good day. And do you remember what we did this time last week? This time last week, we started freaking out about our BBC Asian Network interview because we heard that it was going to be live. In all my frenzy, I did what I do best - write. I sat down for close to two hours, just writing down paragraph after paragraph of things we should say in response to potential questions. A few hours later, you joined me in the frenzy and together, we tweaked the five pages of content I had written down. A few hours after that, Shane quizzed us both and we felt like losers. It took three more days for us to arrive at the conclusion that we didn't need extensive notes and that we spoke best when we enjoyed the conversation. I'm so glad we started on Friday or we would have gone into that interview with our notes that had been categorically organized based on sections and sub-headings. But in the three weeks that it has taken me to respond to your last letter Barb, I feel like I've grown three times more attached to you as a person. The more time I spend with you, the more I like you and I couldn't be happier with our partnership. I've talked about the "woo-woo" we've experienced together as a team here and keeping that in mind, I'm going to wish that sooner than later, we get to work together in the same city, just walking distance from each other. Do you want to bet this wish will be granted in 2018?